Finally, NJTT is offering a cheap way of getting to the mountain and they’re also offering discounts for lodging if you want to make a weekend out of it. TAKE THE BUS & SAVE! New Jersey Transit riders can snag the following discounts when they present their same day bus receipt. The Bike Park discount can be obtained by presenting your bus receipt at the Bike Center. The NJ TRANSIT bus receipt must be dated for the day of redemption for the discount to apply. These offers are not valid on previously purchased tickets. Tickets are not refundable or exchangeable. Cannot be combined with any other offers or discounts. Offers expire September 2, 2013. You can even bring your bikes on board the #304 since there is storage space on the bottom of the bus. Please note that NJ TRANSIT is not responsible for any damage caused to any bike stored below the bus. Restrictions apply. Subject to availability. Valid through September 2, 2013. Guests must present their #304 bus fare receipt dated for the day of arrival to receive the discount at the front lodge desk. Discounts only apply on same day of fare. NJ TRANSIT’s #304 bus will depart from the Port Authority Bus Terminal in New York City, making stops in Weehawken, Union City, North Bergen and NJ TRANSIT’s Wayne Transit Center. This service will begin on June 15, 2013, and conclude on September 2, 2013. The bus route will make interim stops upon request along 30th & 31st Streets in Weehawken, Union City and North Bergen and at NJ TRANSIT’s Wayne Transit Center in Wayne. Bus service will operate on Saturdays, Sundays and on the holidays of Independence Day, Thursday, July 4 plus Friday, July 5 and Labor Day, Monday, September 2. Please arrive at least 15 minutes prior to departure time. Give the bus operator your bus ticket and he/she will give you a yellow fare receipt. Be sure to keep your receipt so you can take advantage of the discounts at the mountain. 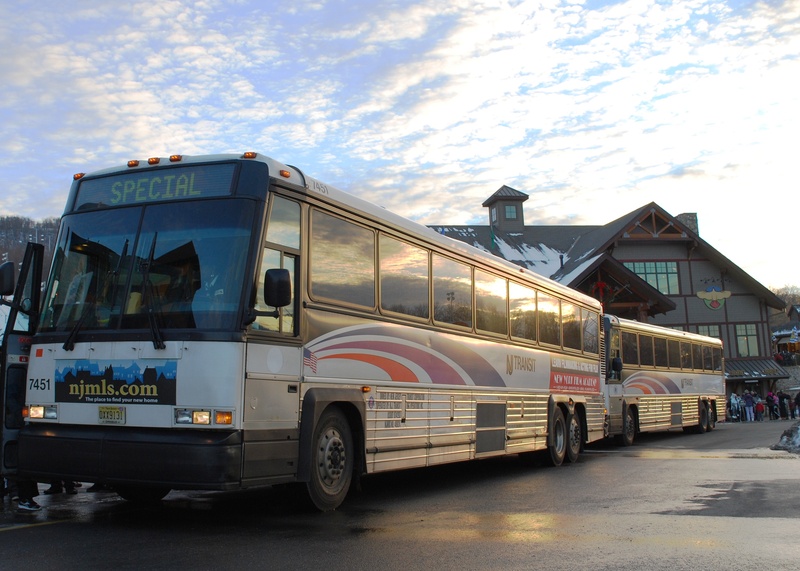 At Mountain Creek Red Tail Lodge, customers may transfer to/from a connecting shuttle provided by Mountain Creek serving the Crystal Springs Grand Cascades Lodge, Crystal Springs Minerals Resort & Spa and Crystal Springs Black Creek Sanctuary. *Family SuperSaver Fares allow 2 children, ages 5 – 11, to ride free with a passenger paying a valid fare on weekends and holidays. If you are departing from the Port Authority Bus Terminal, be sure to purchase your ticket before boarding at Ticket Windows 1 – 10 or from a Ticket Vending Machine. Departing from Wayne Transit Center, purchase your ticket from a Ticket Vending Machine. At all other locations, you may pay on board the bus. This entry was posted in Latest, Newsflash by Iggy. Bookmark the permalink.